Probably the biggest change that came in our home remodel is what happened in our bath. 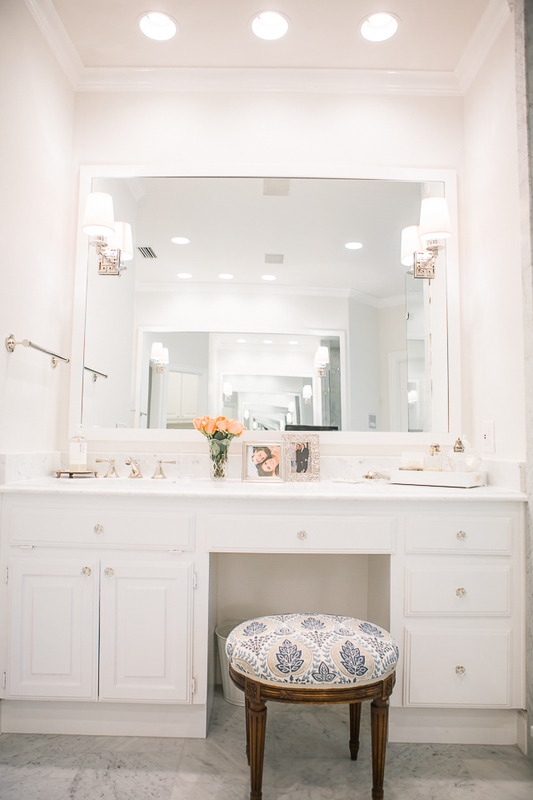 Today, I am sharing the master bathroom reveal with you. 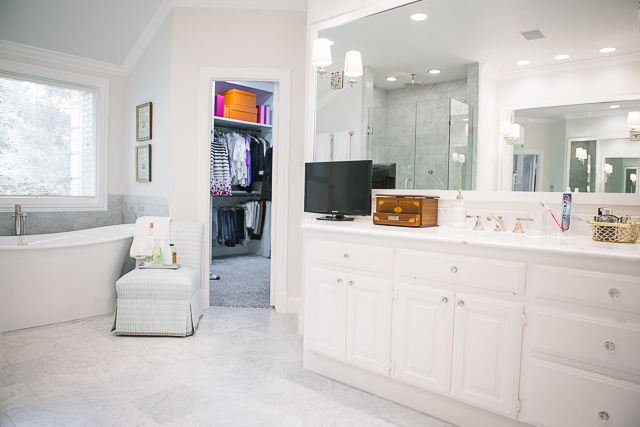 By now you have seen the closet reveal and kitchen reveal blog posts. 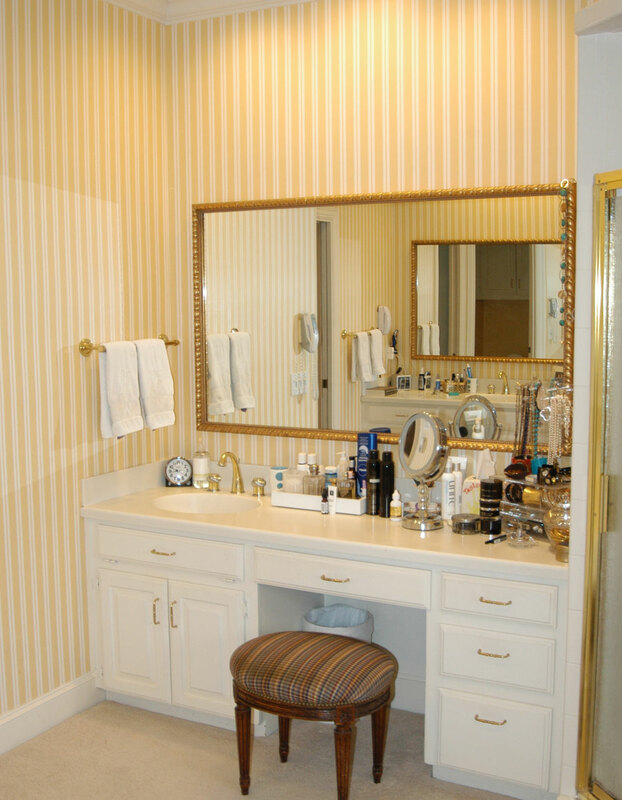 But its the master bathroom that made the biggest transformation. When I met with Lisa Henderson (decorator) and Richard Williams (builder) my main objective in this room was to update and brighten the entire space. 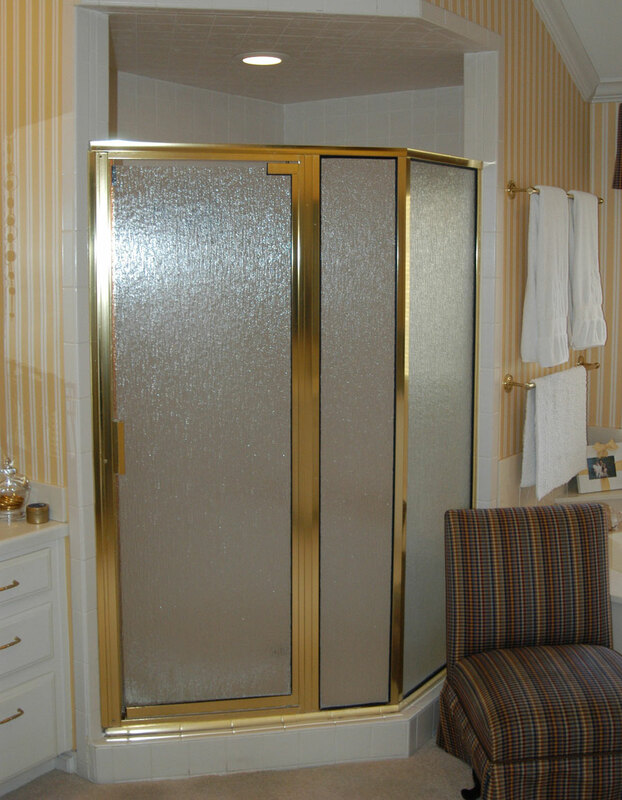 Even though the house was built in 1990, this bathroom felt very 80’s to me. I think I turned on the jacuzzi tub a total of three times. We have a hot tub in our back yard with our pool so there is no need to turn on jets in your bathtub. It felt like I was having physical therapy in a trainers bath. Yuck. We picked out all of the fixtures and the tub at Pirch at the same time we selected the appliances for the kitchen. Joel was so helpful with the entire process. In fact, I climbed in to this Victoria & Albert Toulouse tub in the store. If you follow me on Instagram you probably saw the picture. I had to make sure that it was a deep soaker tub before we made the purchase decision. We also decided on the same white marble countertops that we used in the kitchen. The tile is white carrera tile to compliment the countertop and it is laid in 12″x12″ squares on the floor and hand cut to 6″x12″ pieces for the shower walls and tub surround. 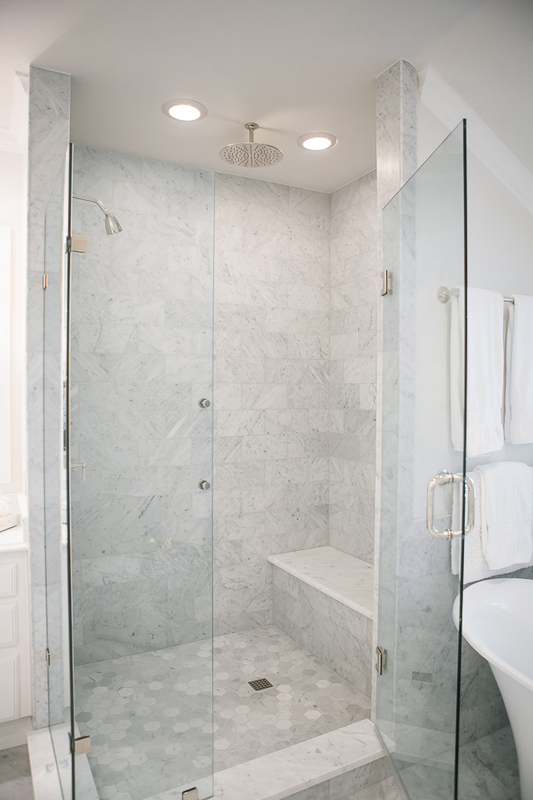 The shower floor is the white carrera tile in a 3″ hexagon. Jason Peters laid the tile with zero grout joints causing the master bathroom to look seamless. 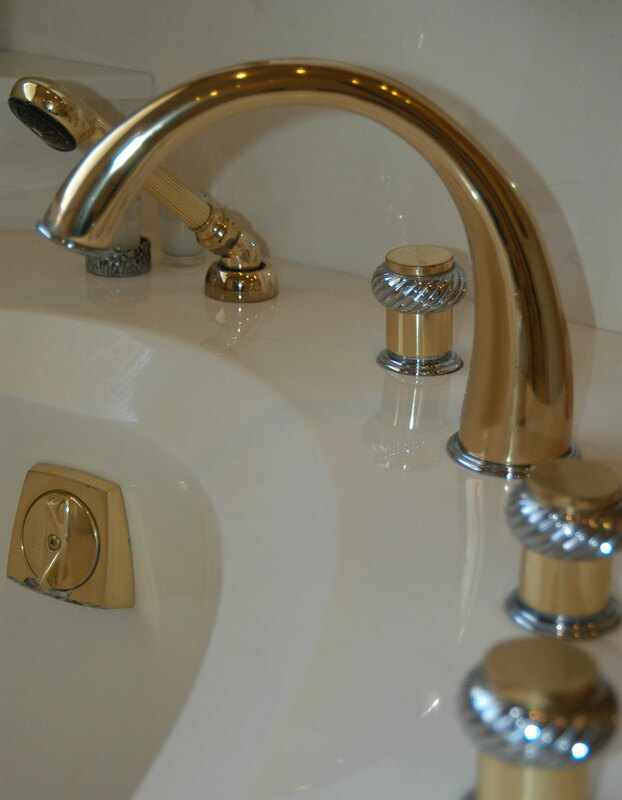 All faucets and fixtures are Waterworks purchased through Pirch and are in polished nickel finish. I chose Emtek Old Town Crystal knobs for the cabinet and drawer pulls and got the doorknobs to match. Those doorknobs remind me of my grandparents house in East Texas. Again, they have a polished nickel finish on the back plate. 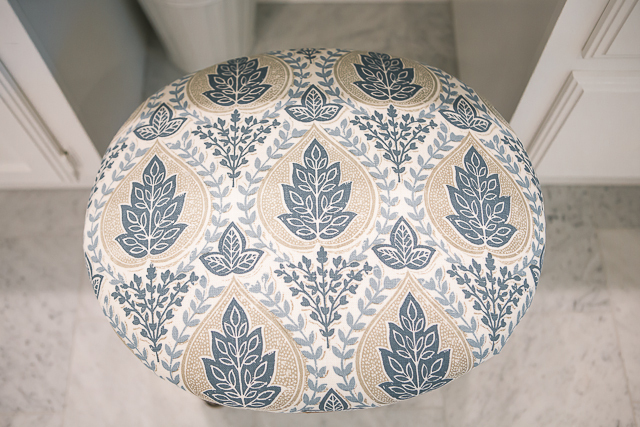 My own upholstered pieces were updated with fabric selections from Travers. Because I went really light and bright in the new master closet, I kept the paint colors similar in the bath. Although there was a lot of trial and error on the wall paint color (my first choice looked like spoiled buttermilk), eventually we wound up with Farrow & Ball ALL WHITE #2005 on trim and WIMBORNE WHITE #239 on the walls. Yes, that is a TV sitting on my husbands vanity. I tried to get rid of it but I had to give in. There are some things you just can’t change and are not worth the argument. I ran to The Container Store to get all the items to organize the drawers and cabinets. You can shop the post below. I am listing all of our design choices below but I want to take this opportunity to again thank every sub-contractor that set foot in my house and worked on our project. The fact that Sparky and Max never ran off is truly a sign of trustworthy people. A huge thank you to Lisa (decorator), Richard (builder), Shawn (cabinets), Carlos (countertops), Jason (tile), Bugsy (electric), Jason (plumbing), Mike (carpenter), Mark (painters), Joel and John (wood floors) and their teams. Fuzzy is so cute! haha! Your new bathroom is killer! I love the clean white. Thank you Luci. Fuzzy is the sweetest! I adore Fuzzy and the bathroom is beautiful !! I wish I had your bathroom for myself. It looks so clean and elegant. I like the gold accents. Wow, what a great bathroom. It is so wonderful and nice. What a beautiful transformation! Loved that your fur baby made the photos! What a gorgeous bathroom!! I think it’s bigger then our whole bedroom and bathroom combined, lol! Lovely room. I’m in the middle of my own master bath reno. 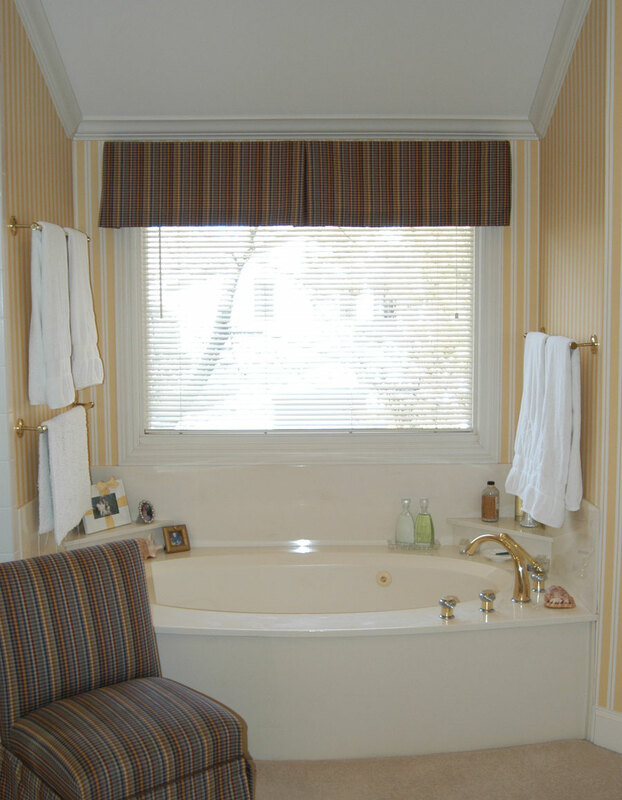 Do you recall where the seat by the tub is from?